ScienceFusion is a state-of-the-art science program designed for building inquiry and STEM skills and optimized for learning in the classroom or at home, on a laptop, tablet, or using a science textbook. The digital curriculum, virtual labs, hands-on activities, and write-in science textbook develop important critical-thinking skills that prepare students for success in future science courses and in the workplace. ScienceFusion® is a registered trademark of Houghton Mifflin Harcourt. As a Google® content partner, HMH has developed field trips for Google Expeditions. Students are swept away into 3D, 360-degree experiences in fascinating locations, directly tied to science content! A Teacher Guide provides ideas for incorporating the Expeditions into your lessons, as well as tips on how to guide and customize the experience. ScienceFusion® is a comprehensive, state-of-the-art K–8 science program. The print, hands-on, and digital curricula provide student-centered options for all students, in any learning environment (home or school, traditional or paperless), and align to the Framework for K–12 Science Education, the foundation for NGSS*. 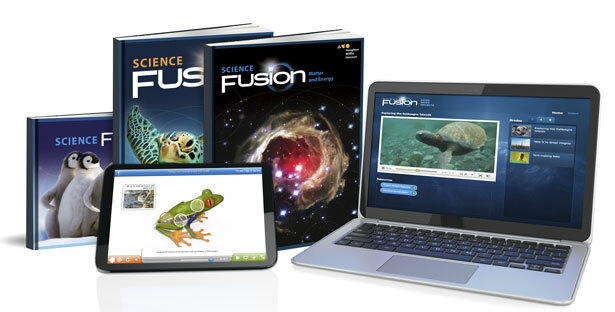 ScienceFusion is a comprehensive print and digital curriculum solution that provides multimodal options for teachers to engage students in exciting, investigation-based learning. This effective, research-based program is easy to implement and fun for teachers and for students. The STEM program in ScienceFusion provides real-world challenges, hands-on activities, and Video-based Projects that develop important critical-thinking skills that will prepare students for success in the workplace and in life. A new spiraled curriculum on Technology and Coding has been added for Grades 1–8, and Kindergarten has a new Technology and Engineering section. The ScienceFusion lab program contains hands-on activities and virtual labs for every lesson or every day of the week. Inquiry lessons (Grades K–5) and labs (Grades 6–8) can be modified to provide three levels of inquiry: directed inquiry, guided inquiry, and independent inquiry. If you are looking for Science Fusion, Homeschool materials, click here.